Pink isn’t prevalent in the modern exterior design, but it’s more common in traditional styles. Here are the 20 most beautiful houses in shades of pink. Even though you are not likely to see a modern design house using a shade of pink, it’s a color that can make a home look very beautiful and unique. Traditional houses, Victorian style houses, beach hoses, and cottage – these are just a few types of residences that choose a shade of pink for a beautiful design. And it’s about time we appreciate it. So we’ve picked out 20 of the unique and impressive house designs that have found a way to use pink in their exteriors. You’ll see how this choice makes a fun and welcoming style. Check them out and tell us which is your favorite? This beautiful summer home is located in Paradise Key South Beach, Florida and you know that it will have class and charm. The exterior of this house is beach style painted in salmon pink and perfectly fits in with the surrounding natural beauty. This beautiful Victorian house with a pool is a real pink dream. The wooden exterior pained in salmon pink go well with off-white trimming and beautiful ornament embellishments. This small house in the rose pink exterior is a beauty. Traditional architecture rarely has so much charm as the choice of color gives this house. This huge house in the Mediterranean style and salmon pink exterior is perfect for its surroundings. The dessert fits the architectural style and the design of this beautiful house. There may be no other style than Victorian that makes use of pink exteriors so well. The house is painted in magenta color with teal trimmings and white windows and the doorway arch. It’s a dreamy combination. This home features a lovely shade of pink that’s accentuated with just a touch of red brick. The variety of pink and purple shades for the roofing shingles adds a nice bit of interest and coordinates perfectly with the rest of the home’s design. The deep rose-pink exterior gives this home a beautiful natural look. It’s an earthy color that lends itself well to the lush green surroundings. The black shutters offer some much-needed contrast that helps create even more interest. This open concept home with a sleek contemporary look is the perfect design for exterior with a pop of bold pink and red. The large windows keep the look light and bright for a fun atmosphere. The beautiful shade of pink and yellow gives this quaint home a lovely warm touch, making it appear very inviting. It looks impressive accentuated with outdoor furniture of the same colors. A spectacular bright pink home with a darker shade of pink used as an accent is a lovely look for this sunny location. To add a bit of contrast, the touch of white on the windows and roof is just right. This attached brick home looks incredible with a wash of pink. It’s the perfect way to make the house stand out from the other brick structures, and the black and white accents on the door and windows are gorgeous. Another pretty home with a bright splash of bubblegum pink that gives the brick exterior a lovely new look. The white accents used for the door and windows provide a nice contrast. The deep, rich, strawberry pink color of this home is stunning, and the curved glass windows and tile roof add a nice touch of design interest. What could be more beautiful than a touch of blush pink on this gorgeous colonial home? The ornate detailing in gray helps keep the home looking very warm and authentic to its original design. This simple adobe style home looks perfect with a beautiful pink exterior. The pink is bright enough to give the home interest, but not so bright that it detracts from the natural design or the wood door and shutters. 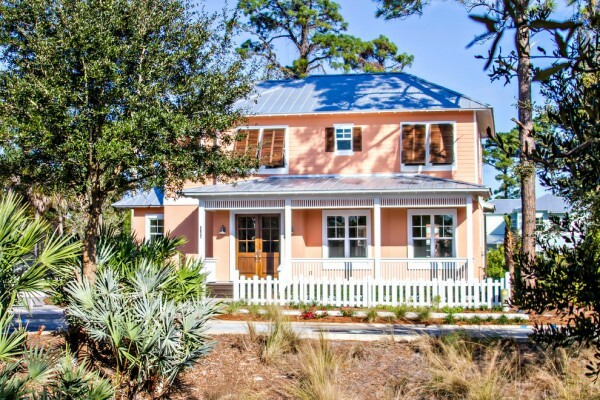 A traditional Creole cottage is a perfect home for a lovely pop of pink. The home is small enough that the bright pink doesn’t seem overwhelming, and the gorgeous detailing adds additional interest. A beautiful rose pink home is made even more pretty with the contrasting black wrought iron balconies. With the white trim and door, this home looks picture perfect. Truly one of the most beautiful pink houses you’ll find. A fairytale comes true. The intricate design of this little gingerbread cottage is stunning with lovely shades of pink and white. The incredible detail and bright colors make this home stunning. This beautiful Victorian home is made even more attractive with a soft touch of pink. The black roof helps the pink stand out, and the white details add just the right amount of contrast. Beautiful 2-story home with two shades of pink creates a cheery and welcoming exterior. The green steps and porch floor add a lovely touch that is a bit unexpected.